As I scrolled through my social media feed one January night, I came across a post from Evan Bernstein, cohost of the popular Skeptic’s Guide to the Universe podcast. 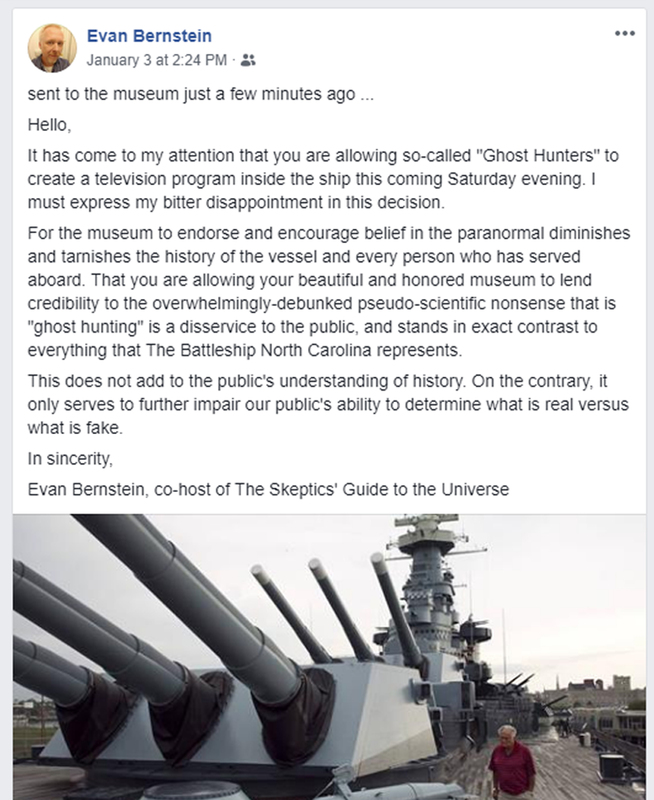 The post linked to an article in The Charlotte Observer titled “Professional ghost hunters to investigate haunting of USS North Carolina battleship” (Price 2019). I had the opportunity to tour the battleship twice and wasn’t familiar with any ghost stories, so I decided to take a closer look. The USS North Carolina, a memorial honoring the 11,000 North Carolinians of all branches of service who gave their lives in World War II, rests quietly just off the Cape Fear River across from the historic district of Wilmington. The keel of the ship was laid in October 1937 and was the first of ten “fast” battleships to join the American fleet in World War II (Battleship 2018). The ship made a name for itself, participating in every major naval offensive in the Pacific and earning fifteen battle stars (battleshipnc.com 2019). The ship helped save the aircraft carrier Enterprise during the Battle of Eastern Solomon’s in 1942 and rescued Navy aviators in Truk in 1944. She’s covered over 300,000 miles of ocean, reportedly been sunk six times (which she wasn’t) and survived a torpedo attack in September 1942 (and kept on fighting). By the end of WWII, ten of the ship’s men had been killed in action with an additional sixty-seven being wounded. The USS North Carolina was decommissioned on June 27, 1947, and stored in the Inactive Reserve Fleet in Bayonne, New Jersey, for the following fourteen years. When word came about that the ship was going to be scrapped, the citizens of North Carolina banded together to form the Save Our Ship campaign. They saved the ship, bringing her home to her current resting place at Eagle Island, just off the coast on October 2, 1961. On April 29, 1962, she was dedicated “as the State’s memorial to its World War II veterans and the 11,000 North Carolinians who died during the war” (battleshipnc.com 2019). The USS North Carolina has been educating visitors ever since. Let’s bring the focus back to the professional ghost hunters and the event they hosted on board the battleship. 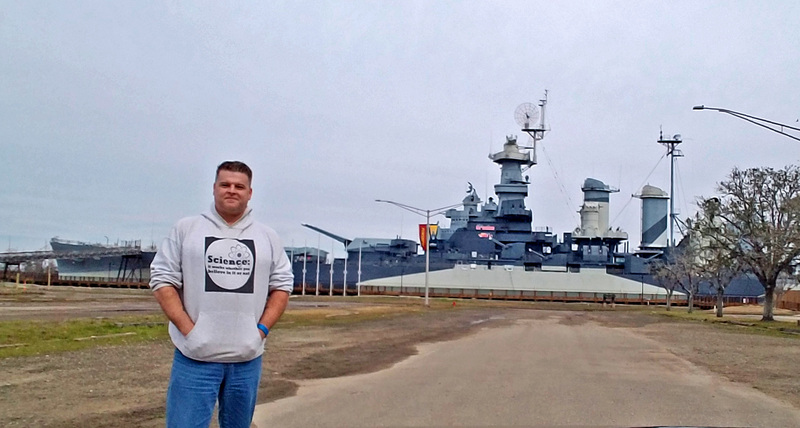 On Saturday, January 5, 2019, the Battleship USS North Carolina was host to the “Death Ship Ghost Hunt,” a poorly-chosen name for an event organized by Ghost Hunt Weekends (an events promoter). I could find no other reference to the nickname “Death Ship” being associated with the USS North Carolina, so I’m assuming the name was a marketing tactic. The event showcased paranormal TV celebrities Steve Gonsalves (Ghost Hunters), Chris Smith, and Mike Goncalves (Haunted Towns)—the alleged professionals—as they hosted an hour-long Q&A, a two-hour Meet and Greet, and finally a 4.5 hour “ghost hunt” throughout the ship. These guys are (un)reality show (semi)stars, not investigators. The battleship and museum are intended to provide historical information about the crew and service of the ship with accuracy supported by records and first-hand accounts of those who served. Ghost hunting events such as these, featuring celebrity “professional” ghost hunters, do not contribute to this intended purpose. On the contrary, they often spread misinformation that leads to a false sense of understanding. As Bernstein noted in his email, “This does not add to the public’s understanding of history. On the contrary, it only serves to further impair our public’s ability to determine what is real versus what is fake” (Bernstein 2019). I reached out to Bernstein and asked him to elaborate on the reasons behind his disappointment with the management of the USS North Carolina. He graciously jumped on Skype with me, expressing the following; “They (the ghost hunters) get so much more attention than they deserve, and I guess that’s one of my main points about that. All this serves as some sort of validation on their part that they were able to get or agree to this event. I don’t know how this came about, but it any case, it offers validity—unwarranted and undeserved—to the ghost hunters, based on something that is based in reality and history … and the two worlds just don’t belong together” (Bernstein 2019). In my experience with the ghost hunting community, Bernstein’s comment about “some sort of validation on their part” does ring true. I’ve come across many (but not all) ghost hunting teams that use famous locations they’ve visited as credentials; listing places such as Eastern State Penitentiary and Waverly Hills Sanatorium as something meant to impress others (e.g., “I’m a big deal because I investigated that place”). Likewise, attending such events with TV celebrities is often mentioned as a way to boost one’s reputation, e.g., “I investigated location X with celebrity X” (this is also true for many cryptozoology and UFOlogy teams as well). Unfortunately, such claims are not an indication that one ghost hunter is any better than any other ghost hunters. These events are not something that should be listed under the qualifications of one’s resume. The USS North Carolina is certainly not the only historic location that has played host to such ghost hunting events. In the past two decades, I’ve found many historic sites have taken an interest in the ghost hunting community as a way to raise funds. Avid ghost hunters and enthusiasts are willing to pay out anywhere from $25 to over $300 (GHW 2018) per person to attend events such as this, and more locations have taken notice. For historic locations and/or tourist attractions that are underfunded, the financial potential from the ghost hunting community is extremely enticing. As I’ve mentioned in a previous article, ghost hunting is a cash cow and once a location gains a reputation for being haunted, their weekends are often booked up quickly (see Biddle 2018). While I still had Bernstein “on the line,” I asked him about historic locations turning to ghost hunting to raise money. He explained that it was a question of who was courting who; was it the museums, as well as other organizations, trying to bring some notoriety and/or activity to their programs? Or is it the ghost hunters “who like to go to places of historical significance because it feeds into their narrative and what they’re trying to accomplish, and certainly gain some level of credibility—where none is deserved” (Bernstein 2019). Bernstein says he’s really not sure that the people who are the decisionmakers of these organizations understand the significance. He goes on to explain “they [historic locations] lending their credibility [to the ghost hunters] [is] a parasitic relationship as far as I’m concerned, that the ghost hunters have everything to gain and nothing to lose by entering a relationship like that. Whereas these museums and other places only sacrifice some of their credibility to undeserving groups” (Bernstein 2019). I understand and agree with Bernstein’s point; part of a location’s credibility is sacrificed for allowing high-profile para-celebrities with their unscientific and irrational methods to promote such events to the public. In the case of the USS North Carolina, this is a historically significant battleship that, by playing host to overhyped pseudoscientific events, lends some of its credibility to the ghost hunters that really don’t deserve it. 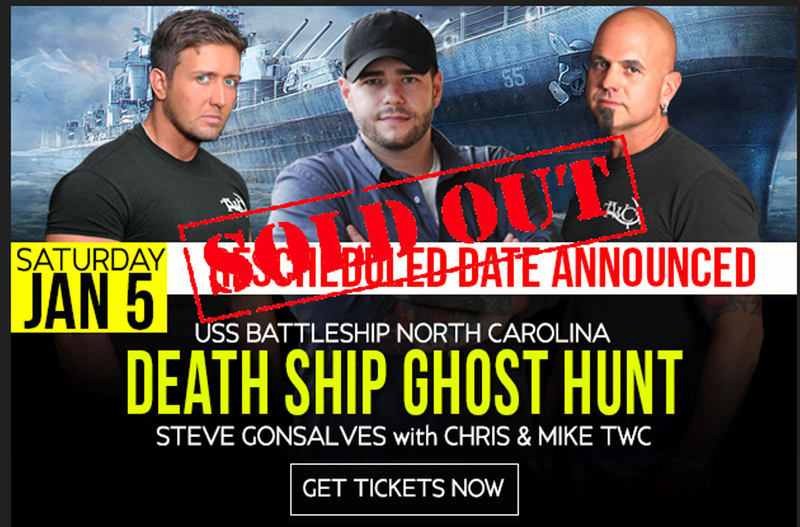 What’s worse, as mentioned earlier, this event was promoted as the “Death Ship Ghost Hunt” on the Ghost Hunt Weekends website—a name that will no doubt continue to be used by those who attended the event (e.g., “I investigated the Battleship North Carolina, ya know, the Death Ship, with the guys from Ghost Hunters”). Over time, these locations can develop paranormal-related reputations that begin to overtake their historical significance. I’ve seen this type of shift in reputation with locations such as Gettysburg, Pennsylvania, which quickly gained a paranormal reputation in the late 1990s and now has over a dozen ghost tours and at least four ghost hunting/metaphysical stores in the small town. These locations are no longer “historical” sites; they become “haunted historical” sites, their reputations forever tarnished. Now, I’m not blind to the perspective of these historical locations. I understand their need (sometimes a desperate one) to supplement funding for required repairs or even basic operating costs. Repairs on old buildings isn’t cheap and available funds can be hard to find. If they are listed on the National Register of Historic Places and are receiving Federal assistance, repair costs can be much higher due to certain restrictions.2 Even with volunteers, many locations struggle to keep the doors open to the public. Of course, you and I have no say in the matter of what kind of events these locations decide to host—this is the decision of the location’s management. However, I don’t always agree with this course of action. I’ve attended many such events over the past two decades. I’m not referring to the classic “ghost tours” in which a guide walks a group through the streets of your local town or city, presenting a mix of history and alleged ghost stories from past guests/visitors (though I have taken many of those too). Those are most often harmless entertainment that sneak in some history. Events such as the one held at the USS North Carolina usually offer some type of “Ghost Hunting 101” or Q&A segment in which attendees are instructed on the “proper” use of equipment. This usually includes what they believe the devices can do, how to take readings, and how to interpret those readings. The issue I have is that the information passed on about the ghost hunting equipment is not always entirely accurate and often blatantly incorrect. They may contain a kernel of truth, but that kernel is often wrapped up in layer after layer of assumptions or mimicry based on little more than (unsupported) beliefs and recycled dialog from ghost hunting TV shows. After attending quite a few of these events, I’ve seen electromagnetic field meters still promoted as being able to detect the presence of ghosts, despite there being no scientific basis for this claim. Attendees are often told that ghosts can speak through modified radios that do nothing more than scan through the available frequencies without muting the sound, blurting out quick snippets of words that are interpreted as ghostly communication. To this day, I still encounter groups that promote using a Mini Maglite (the flashlight trick) for ghosts to answer questions (Biddle 2019). During many of these ghost hunts, there is little if any mention of experimental controls to guard against false-positive readings or other natural and man-made sources for strange readings. More often than not, the team hosting the ghost hunting event (as well as many attendees) have very little to no understanding of how their equipment actually works. The three celebrities of the USS North Carolina event, Steve Gonsalves, Chris Smith, and Mike Goncalves have consistently demonstrated their lack of understanding and misuse of equipment on their television shows, all while claiming to use scientific testing (TWC 2019). They repeatedly used and promoted the flashlight trick and other useless devices (e.g., K2 meter, Ovilus, etc.) as ways to communicate and/or detect ghosts. I’m sure these are nice, friendly guys normally (I briefly spoke with Steve Gonsalves a while back), but they have no business teaching others how to use “ghost hunting equipment” or how to interpret the results. And I think these guys, hosting a paranormal event such as this at a historic location such as the USS North Carolina, diminishes the reputation of the battleship. To be fair, not all paranormal events I’ve attended (or the groups in charge of the events) follow this routine. Quite a few have strived to get better information and quell much of the pseudoscience out there, but these events/group are usually in smaller venues that don’t use para-celebrities to draw in large crowds. I’ve been working with several groups that are actively promoting good research methods and speaking out against the misinformation popularized by paranormal TV programs. You might also be asking “If you don’t agree with these events, why do you pay to attend them?” That’s a fair question with a three-part answer: First, the money usually does go (in part or in full) to the location that needs it for repairs, upkeep, etc. I’m all for supporting historical locations. Second, I collect data on trends, habits, gadget use, etc. while observing the ghost hunters as they go about their business. Third, I often get the opportunity to counter the pseudoscience with good, solid information. I can often explain why a meter started going off “for no reason” or even demonstrate how a strange anomaly showed up in a photograph. I’m polite and helpful, and attendees walk away with a slightly better understanding. As an added bonus, this often gets me invited back, giving me more opportunities to contribute better information. In the end, I agree with Bernstein that locations that open themselves up for public ghost hunts sacrifice a bit of their credibility, developing a reputation for being haunted that goes side-by-side with its history, and most often being placed in front of the history. History begins to get distorted with the addition of ghost and the plethora of reasons they stay behind to haunt the location. Visitors are incorrectly taught how to use devices and interpret the results, contributing to the ongoing misinformation rampant within the paranormal community. It’s a vicious cycle. I did reach out to Stacie Greene Hidek, Marketing Director in charge of Advertising, Marketing, Public Relations & Filming, who was a pleasure to speak with. I asked about the ghost hunting event, whether it was a program developed by the battleship or if it was initiated by the ghost hunters/organizers. Hidek explained that it was not a joint program at all; the battleship was rented for a private event and then Ghost Hunt Weekends sold their own tickets. She also mentioned that because they are a state-run function, they try to be more open-minded when renting the location. I got the impression that as long as someone agreed to the standard terms of the renting the battleship, they would not be refused. 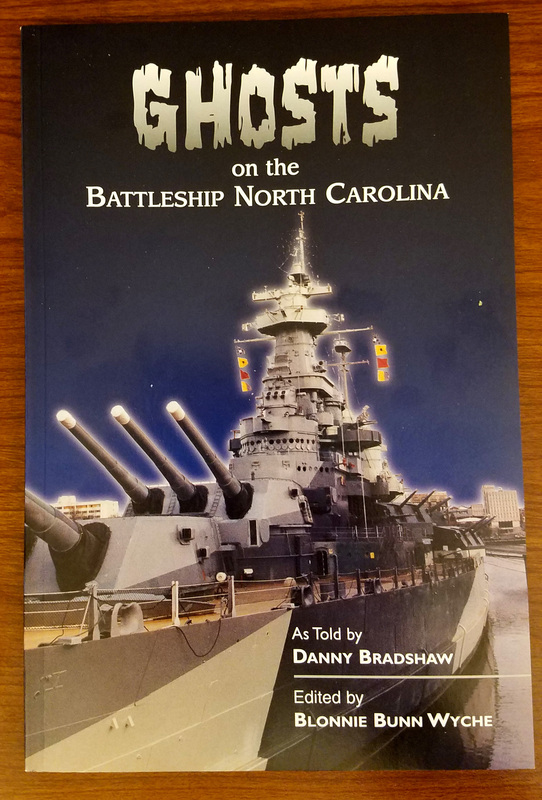 On a recent visit to the battleship, I noticed the gift shop was selling copies of a book entitled Ghosts on the Battleship North Carolina by Danny Bradshaw, so they obviously don’t shy away from the ghostly attention. I’m not discouraging anyone from visiting the USS North Carolina or any other historical location just because they occasionally hold or play host to paranormal events. Quite the opposite; I highly encourage you to visit them … but visit them for the history, the architecture, and the passion of those that work hard to keep these places around for you to experience. Our history is much more entertaining than scripted, cookie-cutter “reality” shows that tend to distort and bend history to fit their ghost stories. I’ll continue to support historical locations whenever I can, and I hope you will too. In fact, as I’m writing this article, I’m about to take a break and head over to the USS North Carolina, which is a short drive from where I’m staying this weekend. The event held at the Battleship was not intended for a television program. It was a stand-alone event organized by the website Ghost Hunt Weekends. Battleship North Carolina. 2018. History. Available at http://www.battleshipnc.com/about-the-ship/history/. Biddle, Kenny. 2018. App-aritions Are Still Causing Trouble. Available at https://www.csicop.org/specialarticles/show/app-aritions_are_still_causing_trouble. ———. 2019. Flashlight Trick. Available at https://www.youtube.com/watch?v=XQp3syfKddE&t=32s. Bernstein, Evan. 2019. Facebook post. ———. 2019. Personal correspondence via Skype. Ghost Hunt Weekends (GHW). 2018. Accessed on January 10, 2019. Available at http://www.ghosthuntweekends.com/battleshipnc.html. 2018. Frequently Asked Questions. Accessed on January 13, 2019. Available at https://www.nps.gov/subjects/nationalregister/frequently-asked-questions.htm. Price, Mark. 2019. Professional ghost hunters to investigate haunting of USS North Carolina battleship. Accessed on January 6, 2019. Available athttps://www.charlotteobserver.com/news/local/article223864065.html?fbclid=IwAR0Z1fumGNKG7iSPBS4RR_SnU9t10BwMaSV2yI4Z9R_vqM8PX1hTazs9V8E. 2019. Bios – Chris Smith. Available athttps://tennesseewraithchasers.com/bios.